Millions of transgender people around the world struggle with gender dysphoria, but nonprofit Point of Pride is here to help. Since being founded in 2016, Point of Pride has awarded over $100,000 in aid to transgender people in 50+ countries worldwide. Now, they are launching a special fundraising campaign called Holding Hope to increase their positive impact on the transgender community. San Francisco, CA, March 11, 2019 --(PR.com)-- Millions of transgender people around the world struggle with gender dysphoria, and make an effort to change their bodies match their gender identity. While getting treatment can be expensive, nonprofit organizations like Point of Pride are here to help. Point of Pride aims to assist more members of the trans community and speak out for the need for inclusive and supportive changes in our society. Since being founded in 2016, Point of Pride has donated over 4,000 chest binders and awarded over $100,000 in financial aid to transgender people in 50+ countries worldwide. They have teamed up with Ultimatum, Inc and Yoobe, Inc for a special fundraising campaign called Holding Hope to increase their positive impact on the transgender community. They hope to raise $5,000 by March 31st, and the first $200 in donations will be matched by Ultimatum, Inc. and Yoobe, Inc.
1. Raise awareness for the campaign on social media with hashtag #HoldingHope. Each post on Twitter will activate donations from donors. 2. Become a donor by visiting the Holding Hope Ultimatum campaign - all donors increase the positive impact of every tweet. 4. 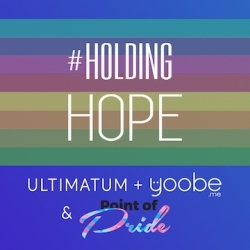 Purchase limited-edition Holding Hope merchandise on Yoobe - 100% of proceeds from each sale will be donated to Point of Pride. Point of Pride co-founder, Aydian Dowling first identified as transgender in 2009, and documented his journey from becoming female to male on his YouTube channel A Lion’s Fear. He spent years saving and fundraising for his chest surgery, which he finally had in 2012. His own journey is what inspired him to create a community to support other transgender people who might be feeling lost and alone. During his transition, Aydian founded Point 5cc, an apparel company which creates clothes and accessories for the transgender people while also supporting programs and services that benefit the transgender community. He later co-founded nonprofit Point of Pride to take over these donation programs and focus on fundraising efforts. Yoobe founder, Genau Lopes explains why he and his team are excited to support Point of Pride: "We noticed that many people who were using Yoobe struggle with gender dysphoria and were looking for ways to fundraise for themselves so that they can afford gender-affirming treatments. We wanted to find a way to help LGBTQ+ folks in our community, and that’s how we discovered Point of Pride. They have several impactful programs to support people in various stages of transition, and we hope that this special joint campaign with Point of Pride and Ultimatum will help raise awareness for these programs, and to show our support for the transgender and LGBTQ+ community all around the globe." Point of Pride is a 503(c)(3) nonprofit organization founded in November 2016 by the leadership of Point 5cc, a clothing and apparel company by and for trans folks. Run entirely by volunteers, Point of Pride works to support trans youth and adults who otherwise lack access through gender-affirming programs that empower them to live more authentically. Yoobe is a collaborative, fast & easy way to create a merchandise store, with artwork designed by fans and creative people, engaging them through an emotional bond. They are supporting Point of Pride's campaign with a special store called Holding Hope: https://www.yoobe.me/holdinghope. All profits from merchandise sold will be donated to Point of Pride for the duration of the campaign. Show your support by creating and donating a design to the store, or by getting your own shirt! Ultimatum (https://beta.yourultimatum.com) is a website that empowers people to take action on the issues they care about and support nonprofits at the same time. Community support is activated real-time in response to events including social media activity, news, and offline events. Click here to view the list of recent Press Releases from Ultimatum Inc.